As your baby starts to get older and take baths outside of their baby bathtub, you may find yourself in the market for a baby bath mat. A bath mat is a great way to ensure that your baby is safe while in the tub. We set out to find the best bath mat for babies, one of our top picks for a bath mat with a kid-friendly ocean-themed design by Warrah. 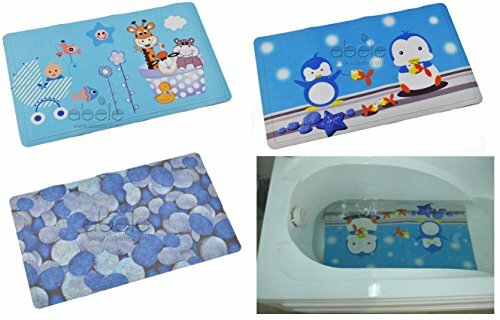 If you are just looking for a safe and reliable option, regardless of the baby theme, we’d go with this Non-slip Tike Smart bath mat that comes in a variety of solid colors. The good news is that it is not your only option! There are quite a few top-rated bath mats that are great for use with babies and kids. Let’s take a closer look. Getting a non-slip bath mat is a top priority for safety. First, we will look closely at the ABELE Design Animal Rubber Non-Slip bath mat. This one has a cute design that your child is sure to love. It is covered with animals that they can use for learning as well. Let’s be real though, the look of the mat is not nearly as important as the functionality and durability. It is designed to offer maximum slip resistance. It has super strong suction cups that help to keep it in place, keeping your baby safe in the tub. It is ultra soft and made of elastic rubber that is free of latex and PVC. This makes it much safer for your baby. You don’t have to worry about mold and mildew. Since this bath mat is antibacterial and resistant to mold and mildew, you can rest assured there is nothing growing under it. It is not suitable for use on tubs that are textured. This is because the suction cups are not as reliable on uneven surfaces. Since it is designed for babies and is really soft, adults who stand on it may actually feel the suction cups. This can be pretty uncomfortable. nefits that are pretty noteworthy – including being machine washable. The surface of the mat has a somewhat rough texture, which may seem to be a drawback at first. This is actually something that makes the mat safer for your baby. It helps with the non-slip feature. There are hundreds of different suction cups on the bottom of the mat. Many mats just have a few cups, which is not good enough. WARRAH offers a 30-day guarantee on their mats. If you don’t like it, send it back and get a refund. It is only designed to work on tubs that have a smooth surface. This is because the suction cups are not able to get full suction if there are any sort of textures on the surface. 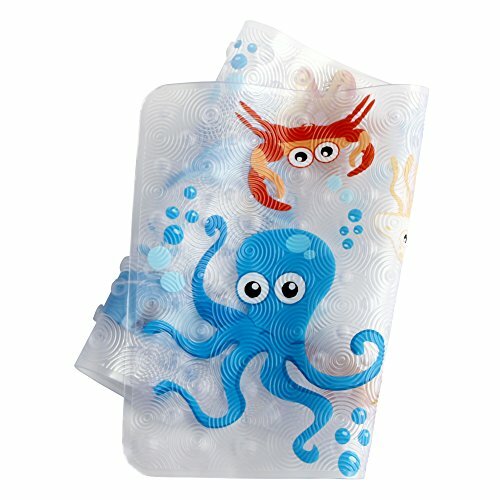 This Yimobra bath mat has hundreds of suction cups. The design is patented and provides high-quality suction cups – 260 of them, to be exact. They feature strong adsorption power that allows you to keep the mat in place on clean and smooth surfaces. You can also pick from different colors and sizes to fit your needs. The mat is antibacterial, BPA free, phthalate free, latex free, and mildew resistant, which makes it perfect for babies. You can choose from the sizes so you can get a smaller one if your baby has his or her own bathtub. The largest size goes up to 34.5 x 15.5 inches. The bath mat is safe for machine wash, so you don’t need to stress over cleanup and maintenance. Simply toss it into the washing machine and get it out clean as new. This bath mat from Paukin has a textured upper side, which provides added traction. It also causes some level of soothing and comfort to tired feet. In addition, the suction cups adhere nicely to the surface after pressing them down nicely. Get a non-slip bathing experience from two sides. The mat is made of high-quality, 100% natural rubber material. It is so eco-friendly and is safe for all skin types, even sensitive ones – such as your kid’s. They are PVC free and latex free. No harmful chemicals are used for these mats. You’ll find a lot of holes all throughout the mat. Most mats have suction in the underside but do not have enough holes. This mat has that – making sure you end up with a safe upper side, without forming too much moisture in the underside – a precursor to mold and mildew growth. The design lets water flow naturally to the drain. It is safe for machine use. Simply toss it into your machine for a fully hassle-free cleanup and maintenance. Enjoy fresh and clean mats every time. This tike smart bath mat is designed to keep everyone in the family – yourself, grandparents, kids, and even babies – perfectly safe during bath time. It is also great in assisting those with limited mobility during baths. 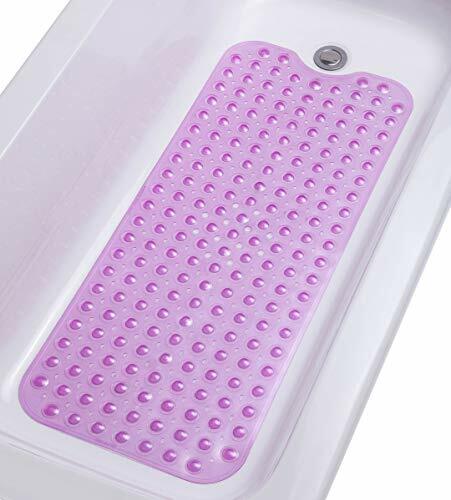 Thanks to its 200 suction cups, you are guaranteed a non-slip bathing experience. It can be used on most non-textured tub surfaces. 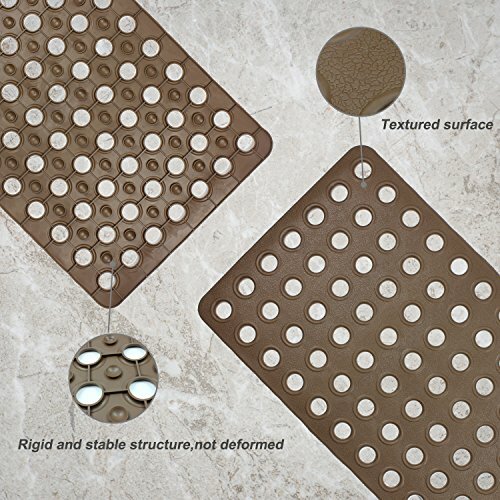 The mat fits most standard tub floors, with over 33% more coverage than other brands. It measures 39 x 16 inches, offering an extra layer of protection from falls and slips. The textured surface adds traction during use. The bath mat is antibacterial and is safe for sensitive skin types, such as kids. It also has 174 drainage holes that facilitate water flow down the drain, preventing mold and mildew from building up. Plus, it doesn’t have BPA, allergens, and phthalates – all of which are bad for your health. The mat is heavy duty and won’t slip on the floor. It’s safe for machine wash, too, so you don’t need to worry about maintenance. The mat comes in a curl-free packaging so you can use it right away. It’s extremely strong and durable than others in the market. Gorilla Grip is very famous for the quality mats that it offers. 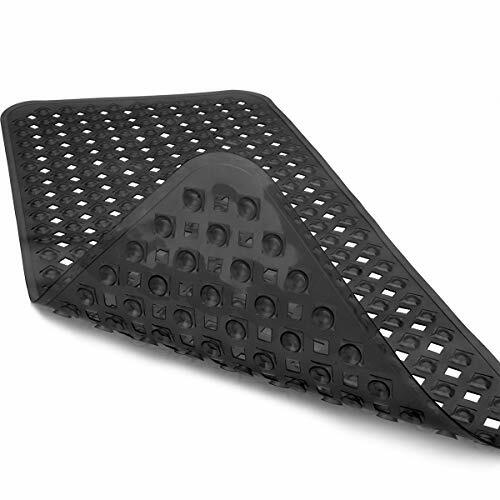 This particular bath mat has 324 suction cups that keep it in place on your bath surface. It can be used by the entire family at home, but many use it in other places, too – such as in the spa and in the gym. The mat itself is extra large – at 35 x 16 inches – and gives more coverage and safety. No areas of your tub will be left exposed. This mat is unlike others in the market which form moist, swampy undersides. No mold growth will take place because of the multiple small holes that let water flow and circulate. The mat is antibacterial, non-toxic, latex free, mildew resistant, BPA free, and phthalate free. The company gives a 10-year warranty for each mat, no questions asked. For any reason that you find yourself unsatisfied with the item, they will replace the mat. 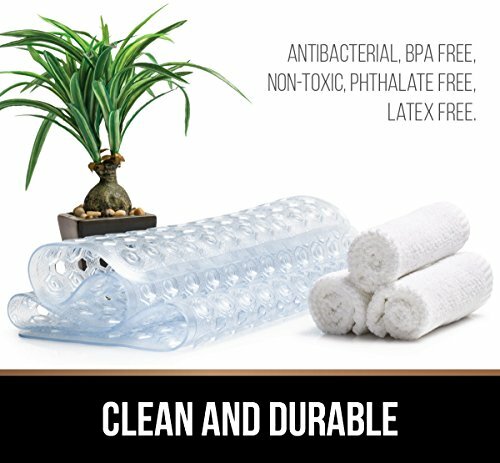 The Uarter Antibacterial bathtub mat is another great choice. We already identified it as our favorite, and this is really because it offers just about all of the features you could be looking for, and it is machine washable! It even comes in a lot of different animal shapes. Offers an anti-slip grip that is sure to keep your baby safe from falls. It also stays in place but is still easy to remove for cleaning. 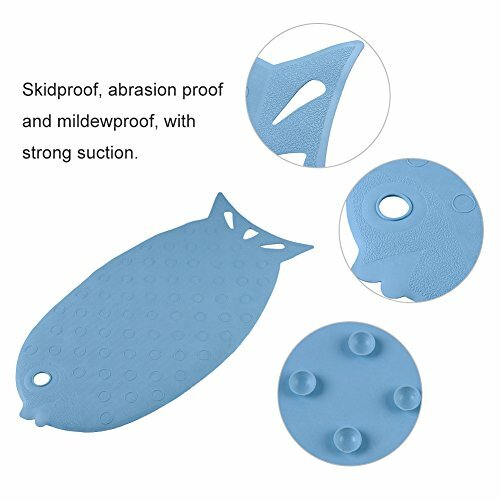 Textured design of the mat helps to gently exfoliate your baby’s skin. There are small circles in the pattern that are gently raised and give this effect. You can easily hang the mat up to dry. There are convenient holes in the design that make hanging it up when it is not being used easy. This helps to keep it cleaner too. The design is a little plainer than some of the other bath mats that tend to have cuter images or designs. Just remember it is mostly about how functional it is, not just about the looks. It is a bit on the smaller side compared to some of the other mats on the market but is still appropriately sized for babies. When you are shopping for a baby bath mat, there are a few things that you will want to take into consideration. First, you always want to make sure that the mat is safe and sanitary for use. This means that an antibacterial bath mat is usually the best way to go. We have all seen the build-up of nasty mold and bacteria that grow under some of the bath mats. Aside from being antibacterial, it is also important to look for one that is slip resistant. Babies, especially when they just begin to stand up on their own, may slip and fall in a slippery tub. The good news is that there are a lot of nonslip baby bath mats for you to consider. Finally, look into how easy it will be to clean the bath mat. Keeping a bath mat clean is really important, but it is especially important for babies. They tend to try to put most things in their mouths, which is why you will want one that is easy to clean. Some of them may even be machine washable. One of the biggest complaints about bath mats is they slip around in the tub or shower basin. The important thing to consider, even after you select a quality mat with a sufficient number of suction cups is that the suction surface has to be clean. You need to periodically wash the bottom of the mat to make sure it is free of residue from soap, shampoo, condition and other bath products. Also make sure that the suction cups have fully adhered to the tub surface before standing on the mat or putting your child into the bath or shower! Push down on the mat as hard as needed to make sure that it has adhered to the bath surface, pushing the entire area and all four corners of the mat. With the flat of your palm push hard on the mat from side to side to make sure it doesn’t slip before using the mat. Also, you’ll need to periodically replace bath mats since the suction cups wear out and the mat loses ability to prevent slippage. It is easy to see that there are a lot of great baby bath mats out there. The problem is that they are not all created equal. And as parents and guardians of our little ones, I’m sure you will want nothing but the best. If you really want to get the most out of your mat when it comes to durability, design, and safety, then you will want to make sure that you shop around. We love that you can simply throw it in the washing machine to keep it clean, along with it being safe and durable. For other ways to keep your baby safe in the bathroom and especially at bath time, click here for our top tips.